Tony-winning Peter and the Starcatcher upends the century-old story of how a miserable orphan comes to be The Boy Who Would Not Grow Up (a.k.a. Peter Pan). A wildly theatrical adaptation of Dave Barry and Ridley Pearson’s best-selling novels. From marauding pirates and jungle tyrants to unwilling comrades and unlikely heroes, Peter and the Starcatcher playfully explores the depths of greed and despair... and the bonds of friendship, duty and love. The show will be performed at The Hudson Guild Theatre, 441 W. 26th st. New York, NY 10001. For group rates, please call the box office at 212-378-0248. Godspell was the first major musical theatre offering from three-time Grammy and Academy Award winner, Stephen Schwartz (Wicked, Pippin, Children of Eden), and it took the world by storm. Led by the international hit, "Day by Day," Godspell features a parade of beloved songs adapted from the Gospel of Matthew. The show will be performed at St. Bartholomew's Church- 325 Park Avenue, New York NY 10022. For group rates, please call the box office at 212-378-0248. More ticket information and packages coming soon! Sweet-natured Alice Sycamore falls for banker's son Tony Kirby. When she invites her snooty prospective in-laws to dinner to give their blessing to the marriage, Alice's peculiar extended family -- including philosophical grandfather Martin Vanderhof, fledgling ballerina sister Essie and fireworks enthusiast father, Paul, might be too eccentric for the staid Kirby's. The show will be performed at The Hudson Guild Theatre - 441 W 26th St, New York, NY 10001. Whodunit? Was it the St. Bart’s Players with a Staged Reading on the 3rd Floor? The St. Bart’s Players will be presenting An Evening Inspired by Clue!, an immersive staged reading of the cult classic movie based on the popular board game of the same name. Join us for a bit of fun and suspense as audience members are taken into the Hill House Mansion for everyone's favorite murder mystery. By the end of the evening, six murders will take place around the audience, and the suspects will be apprehended and escorted out accordingly. The reading will be presented in Room 33 of the St. Bart's Community House at 109 E. 50th Street, beginning at 8pm on Thursday, May 10th and Friday, May 11th. A suggested donation of $5 will be collected at the door for all audience members and there will be a cash bar and concession stand. Seating is general admission, on a first-come first-serve basis, with no advanced sales. All proceeds will support the St. Bart's Players. 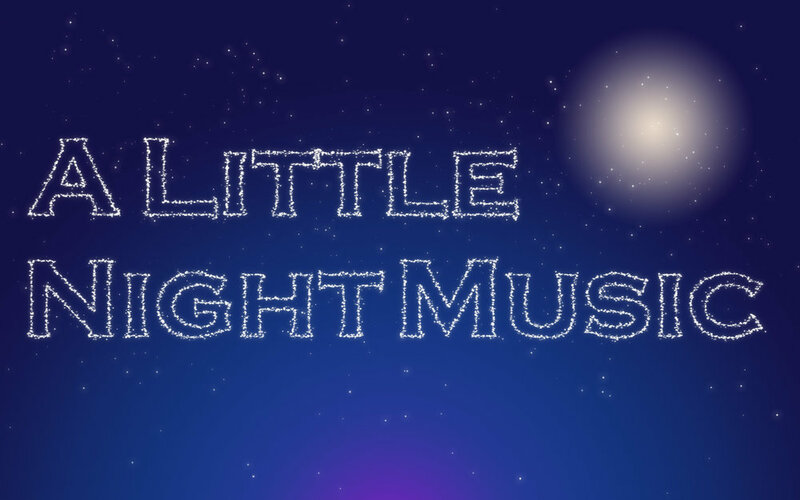 If you are in love, out of love, searching for love or disappointed by love, you will enjoy this cabaret showcasing songs about love and all its ups and downs, and everything in between. 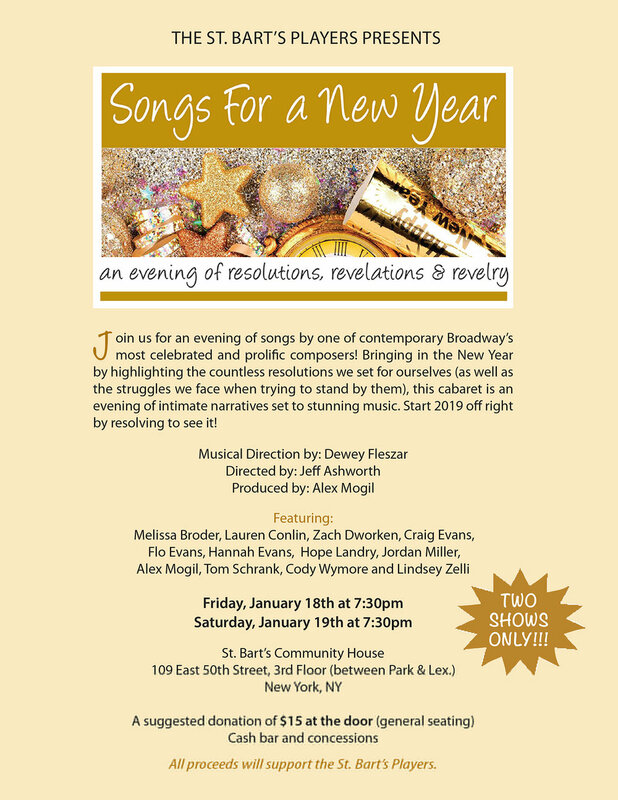 This show will feature solos and duets that illustrate the many kinds of love—not only romantic love but also love for friends and family, as well as love that is unattainable, unrequited or lost. Based on Ingmar Bergman’s beloved film Smiles of a Summer Night, the original production of this musical won six Tony Awards, including Best Musical, Best Book and Best Score. $30; students and seniors: $27 *All tickets are $25 for the Wednesday, October 25th performance. **$50 "A Weekend in the Country" package, including premium seating and one complimentary drink & a concessions snack. The 2001 Tony Award Winner for ‘Best Revival of a Play,’ One Flew Over the Cuckoo’s Nest follows criminal Randle McMurphy, who has gotten himself into trouble once again and been sentenced to hard labor in prison by the court. To escape labor duties, McMurphy pleads insanity and is sent to a ward for the mentally unstable. Once there, he endures and stands witness to the abuse and degradation committed by the oppressive Nurse Ratched against the inmates. Based on Ken Kesey’s 1962 novel, this is a powerhouse play you won't want to miss. *90th Season Opening Night Party!